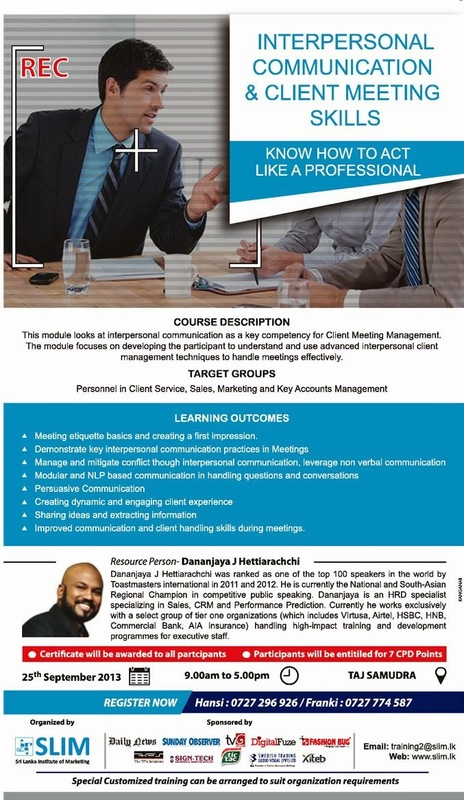 This module looks at interpersonal communication as a key competency for Client Meeting Management. 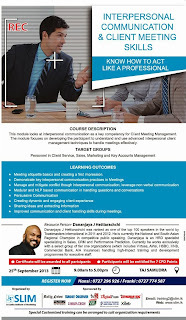 The module focuses on developing the participant to understand and use advanced interpersonal client management techniques to handle meetings effectively. Meeting etiquette basics and creating a first impression. Demonstrate key interpersonal communication practices In Meetings. Manage and mitigate conflict though Interpersonal communication, leverage non verbal communication. Modular and NLP based communication in handling questions and conversations . Improved communication and Client handling skills during meetings. Dananjaya J Hettiaractichi was ranked as one of the top 100 speakers in the world by Toastmasters international in 2011 and 2012. He is currently the National and South-Asian Re9ional Champion in competitive public speaking. Dananjaya is an HRD specialist specializing in Sales, CRM and Performance Prediction Currently he works exclusively with a select group of tier one organizations (which includes Vlrtusa, Airtel, HSBC, I-INB, Commercial Bank, AlA Insurance) handling high-Impact training end development programmes for executive staff.